GREENVILLE - Mrs. Mary Lynn Dearing Overbey, age 93, of Greenville, died on Tuesday, February 14, 2017. She was born in Caldwell County, Kentucky to the late Oscar Glenn Dearing and Anna Stallins Dearing. 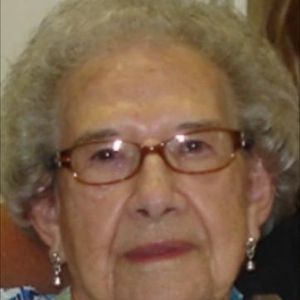 She was a member of the First Christian Church in Greenville, where she served as a long-time deaconess. She was a Past Worthy Grand Esther of the Kentucky Order of the Eastern Star. Mrs. Overbey was known for her made-with-love needlework and her excellent culinary skills. In addition to her parents, Mrs. Overbey was preceded in death by her husband of 72 years, Guy Louard Overbey; an infant daughter, Deanna; her sisters, Mavoline Dearing Clayton and Joan Dearing McGregor; and brother Garnet Pershing Dearing. She is survived by her son, Douglas Overby (Gail) of Florence, Alabama; daughter, Karen Overbey Gentry (Bill) of Lexington, Kentucky; Granddaughter, Carol Overby Cummings (Mike)of Greenbrier, Tennessee; Grandsons, Jay Gentry of Gainesville, Florida and Ross Gentry of Ashville, North Carolina; great-granddaughter, Hannah Cummings of Bowling Green, Kentucky; and sister, Joyce Dearing Watson, of Fernandina Beach, Florida. Funeral services will be Saturday, February, 18, 2017, at 2:00PM at Tucker Funeral Home in Central City with Mr. Paul Moore officiating. Burial in Evergreen Cemetery. Visitation will be Saturday after 12:00PM at the funeral home. Expressions of sympathy may take the form of memorial donations to First Christian Church, 133 E. Main Cross St., Greenville, KY 42345. Envelopes will be available at the funeral home. Online condolences may be made at www.tuckerfuneralhomes.com. She was an inspirstion to all her Eastern Star sisters and brothers. She will be missed by all who knew her.